I moved out of my parents’ home in San Juan when I was 21, just a few months after graduating. I was young and reckless and in love, and needed the freedom to make huge life and career decisions out on my own. The place I chose to live was Westmont Village, a highly-compressed modular condominium complex sitting behind a branch of Westmont Bank on Sucat Road, in the middle of Parañaque City, a southern suburb of Metro Manila. The rent? Per month, the peso equivalent of about $50. There were lots of friendly feral cats, too. Full photoset: Westmont Village. Next post: It’s a Brownpau Holiday Extravaganza! Yeah, I remember reading your blog back in those days. A lot has happend since then, hasn’t it? Isn’t that a bit pricey for a Paranaque City condo room? (My parents live in Las Pinas City. The Makati Loop van would charge PHP50.00 for a one-way trip from LP to Makati City and vice versa). 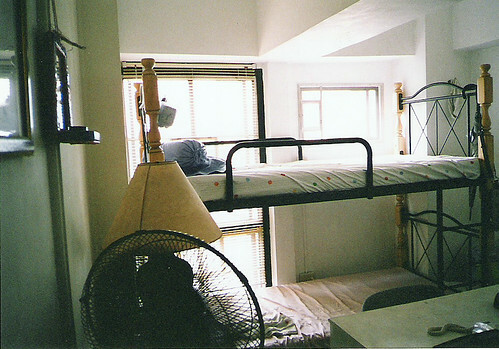 In 2000, I rented a room with bathroom and communal kitchen in Bel Air Subd. for PHP4,000/month. Considering that the condo-type building is located in Makati (one minute away from Jupiter St.), it was a good rate (I think).